Editor's Note: This post is authored by Lauren George. 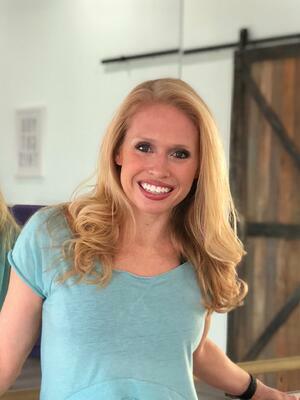 Lauren is the co-creator of the enhanced Barre Above® program, a Balletone® Master Trainer, serves as adjunct faculty for the Leisure Skills department at Clemson University, and is the owner of Clemson Fitness Company, in Clemson, SC. 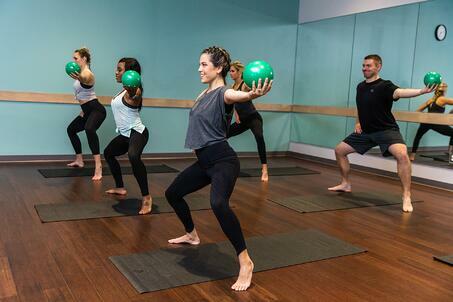 Barre is a fusion of ballet, Pilates, yoga, and traditional strength training. You will execute targeted muscle conditioning exercises utilizing the barre for balance. Barre was created by a ballerina who was rehabbing from an injury. It was never meant to be a dance class, so don’t worry, no one will ask you to twirl across the room, wear a tutu, or put your foot up on the barre to stretch. It is a low impact, high energy, total body workout for EVERY BODY! What's the atmosphere of a barre class? Barre is a muscular endurance class. Participants should expect a fun and upbeat atmosphere! There are mind/body components to barre classes such as a focus on concentration and staying present in one's movements. What can a first-time barre student expect when coming to class? I believe barre has gotten a bad reputation of being intimidating, where in all reality, it is a great workout for all fitness levels. It is low impact, easy to follow, simple to modify to fit your needs, and fun! When you head to your first barre class, make sure you arrive early enough to set up in a spot with a good view of the instructor. Ask your instructor what equipment is needed for the class and go light on the weights at first (trust me, you will be shocked how heavy 3 lbs can feel after a few minutes). Once the music starts, remember this is your workout, so take any and all options that feel right for your body. Typically, class will begin with a standing warm-up done in center floor (away from the barre). Then, you will either perform some upper body work with dumbbells or head straight to the barre. You can expect to spend 25-35 minutes at the barre before moving to the floor for core conditioning and flexibility work! What are the physical benefits of a barre workout? Barre is a total body workout that will challenge your lower body, upper body, and core in new ways! It improves muscular endurance, flexibility, posture, and mood, and decreases stress and blood pressure. Additionally, it is low impact which decreases participants risk of injury. In barre classes, we perform numerous exercises in a “turned out position” (toes pointed out to 45 degrees with the rotation initiating from the hip joint). These exercises strengthen the often-neglected hip abductors and external rotator muscles which helps to balance muscle strength within the body. Every exercise in barre initiates from the core. We focus on engaging the pelvic floor and transverse abdominals throughout class to “zip up” through the torso elongating the spine and working in neutral pelvis. By doing this, the entire class becomes a core workout! How often should someone do barre to see results? Barre falls under the category of muscular endurance training which experts suggest completing 2-3 times per week. One of the great things about barre classes is that you will experience a lot of variety in equipment depending on what your club has. This keeps your body learning new things and continuously improving. Your muscles must learn how to adapt to new challenges when a new piece of equipment is added to the mix. Some of the most popular pieces include, Bender balls (Pilates balls), gliding discs, therabands, looped tubing, light dumbbells, Pilates circles, and of course, the barre (you can definitely use a chair or no barre at all and still get a great workout). Interested in trying a barre class at O2 Fitness? Check out the group fitness schedule at the club nearest you!